Russia celebrates the 71st anniversary of Nazi Germany's defeat; follow our live updates from Red Square, where the annual military parade took place. We hear the ‘Farewell Slavianka’ march which was written more than one hundred years ago but is still dear to the heart of most Russians. The orchestra now starts leaving the Red Square. Dear veterans of the Great Patriotic War and the guests of the parade! Today we saw the annual military parade celebrating the 71st WWII victory. Let us pay our tributes to the veterans of the Great Patriotic War and let us celebrate the 71st anniversary of the Great Victory. Now we can see a ‘tactical wing’ which contains SU-34, SU-27 and Su-35S. Su-34 bomber-fighter jets are flying over the Red Square. The last aircrafts in today’s parade are six SU-25BMs. These twin-engine jets fly only 300 meters above Moscow’s main square with the speed of 550 kilometers per hour and disperse the smoke of the colors of the flag of the Russian Federation. A multifunctional helicopter MI-26 and four MI-8 helicopters open this part of the parade. Anti-armor attack helicopters MI-28 can are now flying above the Red Square. We now see KA-52 and Mi-35 helicopters. These are used as heavily armed scout helicopters which can exterminate military machinery on the ground as well as in the air. Now Mi-35s are flying over the Red Square. Now we see the legendary AN-124 ‘Ruslan’ – the largest freight airplane in the world. The three planes we now see above the Mausoleum are multi-purpose freighters IL-76. Three large four-engine turboprop-powered strategic bombers TU-95MS. Tu-22MT aircraft are flying over the Red Square. We can now see IL-78 tanker and supersonic variable-sweep wing strategic bomber TU-160. The next machines that we will see will be four fourth-generation jet fighter aircrafts MIG-29SMT. MIG-29SMT are immediately followed by four SU-24M – supersonic all-weather attack aircrafts. The column features new multi-purposed infantry vehicles. Now we see the convoy of short to medium range air defense missile systems Pantsir-S1. Anti-aircraft missile systems S-400 Triumph enters the Red Square. A column of Yars missile launchers enters the Red Square. Iskander, a mobile short-range ballistic missile system, is crossing the Red Square. Rolling into sight anti-aircraft missile systems Buk-M2. Armata battle tank will became the main tank of the Russian Ground Forces. Coming next is a group of MSTA-S howitzers, self-propelled 152 mm fighting vehicles designed by Maj Nikolai Vasilyev. The MSTA-S artillery system is designed to dispatch of enemy targets and live force. Rolling into sight is a pack of armoured personnel carriers "Typhoon"
A column of modern infantry fighting vehicles BMP-3 are crossing the Red Square. New generations on APCs based on Kurganets military platform are crossing the Red Aquare. A T-92A tank division, equipped with state-of-the-art guns that can engage both aerial and land targets, is crossing the Red Square. Military Bands are now leaving the Red Square to give room to military equipment. At least 135 pieces of military vehicles are taking part in the parade. A column of Arbalet, Tigr is passing the Red Square. Next in the line are the Kremlin cadets. It is the only military academy which is allowed to conduct its graduation ceremonies in the Red Square. 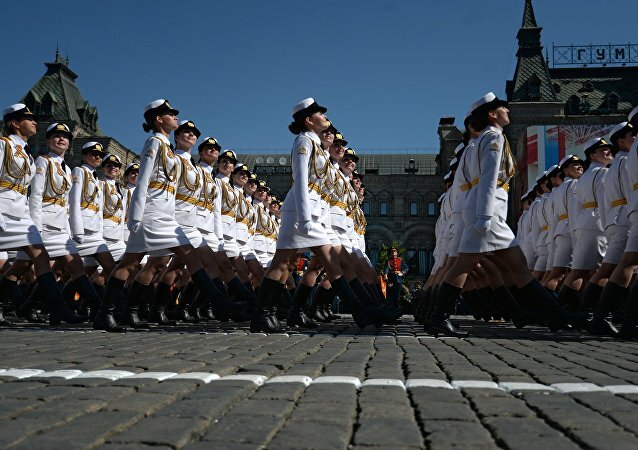 Cadets of the Moscow border guard institute of the federal defense agency proceed onto the Red Square. Next in line are military divisions of the country’s West Military District. Marching in file are guards from the Tamanskaya Motor Rifle Brigade. Cadets from the Timoshenko Military Academy of Engineering, Chemical Defense and Control are crossing Red Square. Its graduates were first responders to the Chernobyl nuclear disaster. The strategic missile forces are reliable shield of our country. Marines of the 336th Independent Naval Infantry Brigade with the Baltic Fleet’s coast defense regiments are taking part in the parade. Marines showed great heroism in battle protecting Odessa, Sevastopol, Novorossiysk, Leningrad during the Second World War and landing on the Baltic coast, in East Prussia and beyond the Pole. Commanding the parade is general of the Russian Ground Troops, Col. Gen. Oleg Salyukov. The motorcars carrying the Defense Minister and the Parade Commander will meet and stop in the very center of Red Square. Russia's Defense Minister Gen Sergei Shoigu and Col Gen Oleg Salyukov start to inspect the troops. Both motorcars are driving simultaneously at the same speed. This year servicemen from the Russian Air and Space Forces and the National Guard are participating in the parade for the first time. The flag bearers are accompanied by an assembled Honour Guard of the three armed forces: ground troops, air force and navy. Marching along Red Square are cadets from the Moscow Suvorov Military School, many of whom are perusing a military career as their ancestors did before them. Closing ranks with their peers are cadets of the Nakhimov Navy School, whose fledglings today serve on all military vessels of the Russian Navy. The solemn military march is headed by parade commander, Col Gen Oleg Salyukov. The military parade is traditionally opened by the Drums Corps of the Moscow Military Music School who set rhythm and tempo of parading battalions. Cadets of the Military Music School opened the very first Victory Parade on June 24, 1945. President Vladimir Putin declares a moment of silence. "This year marks the 75th anniversary of the start of World War Two. In that moment, the lives of the Soviet people changed. Our first priority was to save our homeland," the president said. "Our army sent the army of the aggressor back where they came from," he added. "Our fathers and grandfathers were able to defeat this enemy. Our people brought retribution to the Nazis." "Nowadays, civilization faces a new threat. We stand ready to build a new block of international security to defeat terrorism," Putin said. "Today is the day of the Great Victory, Hooray!" The address of the Russian President followed by the National Anthem. Over 10,000 servicemen are involved in the parade, as well as 206 armored vehicles, Russian Aerospace Forces aircraft and helicopters. He greets the troops on the 71st anniversary of the World War II victory. The national flag of the Russian Federation and the Victory Banner of the 1941-1945 Great Patriotic War are brought onto Red Square. ​Among the flag-bearers are honour guards from the 154th Independent Commandant's Preobrazhensky Regiment. Guards from the Preobrazhensky Regiment have the honour to start the military parade in Russia's main square. 71 years ago, Sgt Mikhail Yegorov and Jr Sgt Meliton Kantaria of the 150th Idritskaya Division raised a Soviet flag over the Reichstag captured during the Battle for Berlin. This flag came down in history as the Victory Banner. The Kremlin clock chimes. The parade commences. 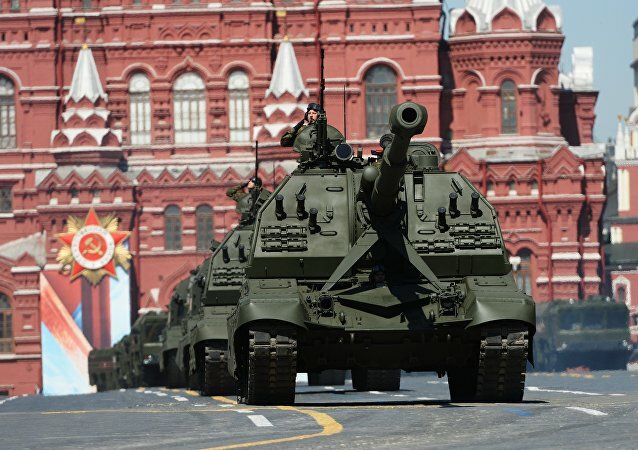 About 10,000 servicemen, 135 military vehicles, and 71 aircraft will take part in the 71st Victory Day parade in Moscow. This year servicemen from the Russian Air and Space Forces and the National Guard will participate in the parade for the first time. This will also be the first May 9 parade to feature female soldiers. 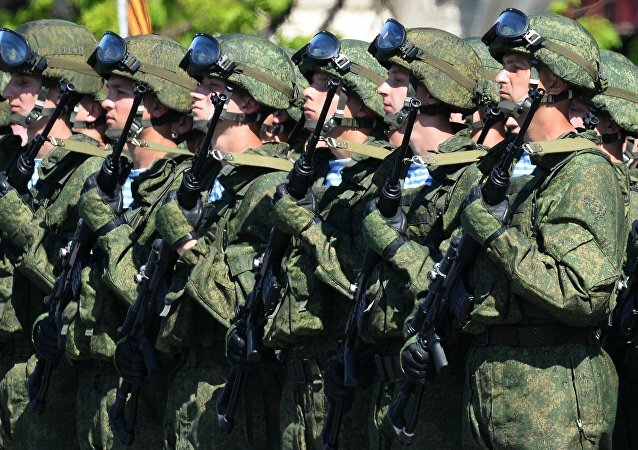 They are cadets from the Ministry of Defense's Military University and the Wolsky Military Institute.